This sturdy and robust pressure washer satisfies all frequent and large cleaning tasks. It is built for durability with a long lasting induction motor and brass cylinder heads. Metal pump with induction motor and brass cylinder head for high durability. Handles all tasks on surfaces up to 60 m2/ hour. Excellent mobility on all types of surfaces with built-in trolley and large wheels. Covenient accessory storage in the machine. Easy storage of electric cable. Built-in detergent dosage-function and regulation. Long lance and telescopic handle supports good working positions. 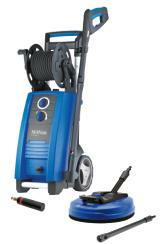 X-TRA model includes trolley and hose reel.